Anthony Dawson makes his move against Grace Kelly in Dial M for Murder. Alfred Hitchcock’s (Psycho) classic 1954 suspense thriller film Dial M for Murder was one of the first films that helped Warner Bros. introduce 3D in U.S. theatres in the early 1950s. That said, audiences will now be able to see the film in their homes as it was originally meant to be seen in theaters nearly 60 years ago. Starring Grace Kelly (To Catch a Thief), Robert Cummings (My Geisha) and Ray Milland (The Thing with Two Heads), the film focuses a love affair between American writer Mark Halliday (Cummings) the married Margo Wendice Wendice (Kelly) in London. After sensing Margot’s affections for Halliday, her husband, Tony Wendice (Milland), fearing divorce and disinheritance, plots his wife’s death. Tony blackmails his nefarioius former school chum Captain Lesgate (Anthony Dawson) into conspiring to kill Margot. When she ends up killing Lesgate in self-defense, Tony implicates her as being guilty of premeditated murder. Halliday must out-strategize Tony to save his lover’s life. Originally designed to lure audiences away from their TV sets, the 3D process utilized a left-eye/right-eye dual projection process and polarized glasses, the basis for what is seen today. 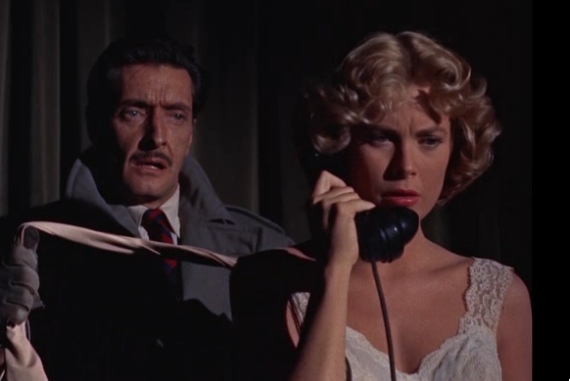 However, with the advent of widescreen formats and the higher costs associated with 3D, the fad was fading by the time Dial M for Murder was released in theatres. As a result, most 1954 moviegoers only saw the film projected in 2D, and it wasn’t until the early 1980s that a classic 3D film revival allowed Dial M for Murder to be briefly seen theatrically, albeit in a faux 3D 70 mm composite print. Now that Warner has restored the original 3D presentation, fans will be able to see the genuine article. A 2D version of the film will also be included. This one will make a good companion piece to Universal’s upcoming Alfred Hitchcock Masterpiece Collection, a 15-title Blu-ray compendium coming on Sept. 25. Bonus features on the Blu-ray include two featurettes– Hitchcock and Dial M and 3D: A Brief History, along with a theatrical trailer. On the same date, Warner will issue a Blu-ray edition of Hitchcock’s classic 1951 thriller Strangers on a Train.